When running iOS Simulator, I can only choose to run 7.0.3 or 6.1, so 6.0 is really not yet installed. A week ago I installed Xcode on another Mac (also running Mavericks); at that time it was no problem to install the iOS 6.0 Simulator using the same method. I have already tried removing the ~/Library/Caches/com.apple.dt.Xcode/ folder, which appears to hold the cached downloads and metadata. However, this had no effect. And of course I've hit the “Check and Install Now” button several times and also restarted Xcode a few times, all without effect. 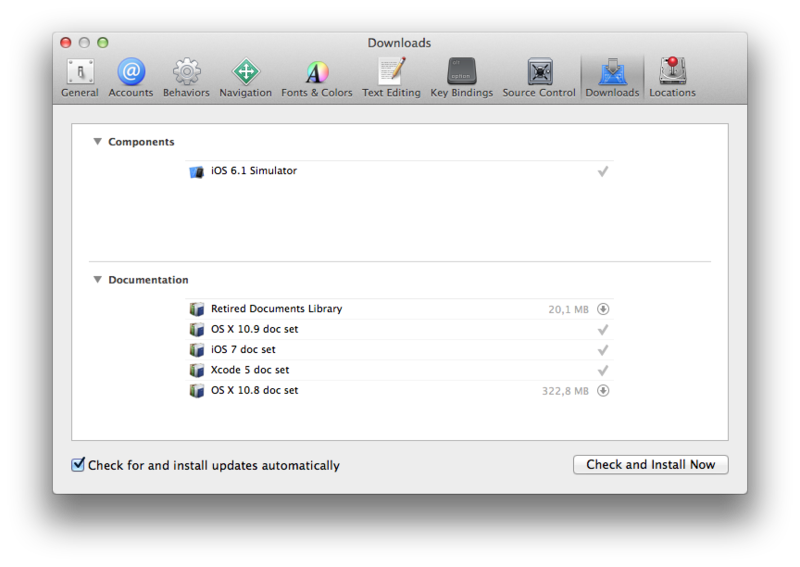 Does anybody have an idea how I can install the iOS 6.0 Simulator? Apple replied to the radar I filed. Apparently the iOS 6.0 simulator is not compatible with Mavericks. Not the answer you're looking for? Browse other questions tagged xcode ios-simulator xcode5 osx-mavericks ios6.0 or ask your own question. In OS X 10.10 (Yosemite Beta), How do I Test Using iOS 6.1 Simulator? Why can't I see the iOS 7.0 simulator in Xcode on Yosemite?